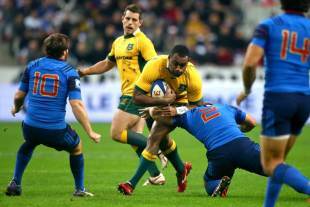 The Wallabies have suffered their first defeat under Michael Cheika with a 29-26 loss to a spirited France in Paris. A new-look and much-improved French side avenged their 3-0 series loss in Australia in June with a deserved victory amid an electric atmosphere at Stade de France. The match finished two tries apiece, with a late Wallabies fightback falling short to end their hopes of a European clean sweep and handing France only their second win in the past 10 Tests between the nations. The tourists fought gamely and almost stole victory after a 74th-minute Rob Simmons try put them within three points but Cheika admitted it would have been unjust. "I was pretty surprised we were in with a shot towards the end because the way we played probably shouldn't have put us there," Cheika said. "It wasn't pretty. I think that's an apt way to describe it. Too many simple mistakes at key moments didn't really give us any opportunity to get on the front foot. I think it wasn't a good effort around the basics of the game." While much of the focus had centred on the scrum battle leading into the match in Paris, the Wallabies held their own up front for most of a feisty game that threatened to boil over at times. Instead it was simple mistakes - in handling, set pieces and decision-making - that cost them. Australia also struggled to penetrate an aggressive French defensive line as the hosts successfully shut down attacking weapons Israel Folau and Tevita Kuridrani. Adam Ashley-Cooper and Rob Simmons scored tries in each half, with Bernard Foley's flawless boot keeping them in the game late with four penalties. Both of France's two tries came in the first half, including a brilliant solo effort by exciting winger Teddy Thomas. Despite France's dominance in the first half, Australia only trailed 17-16 at half-time. Prop Sekope Kepu led the team out in his 50th Test and almost had the Wallabies off to a brilliant start when he charged down a Scott Spedding kick after just 30 seconds. Lock Simmons crossed the line but was ruled to have knocked on and, from there, the French took control. Australia were their own worst enemy at times, let down by a lack of composure and poor handling. It was a James Horwill knock-on that led to France's first try, with Sebastian Tillous-Borde crossing from close range in the sixth minute. A strong kick-off chase allowed Australia to hit back swiftly through a Foley penalty but the Wallabies were going side-to-side in attack under intense pressure. Australia's defensive frailties were exposed when Thomas crossed for the try of the game in the 28th minute. The 21-year-old winger, who scored a hat-trick on debut against Fiji last week, had a field day against a broken Australian defensive line, shrugging off five attempted tackles before running under the posts. 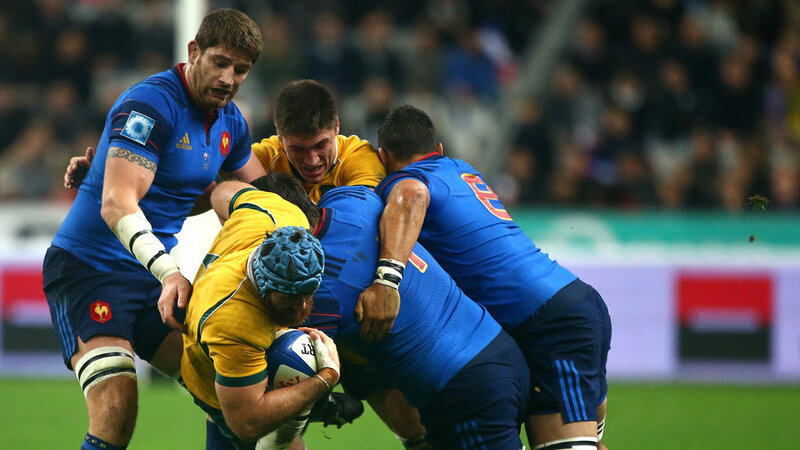 With France well on top, the Wallabies scored a crucial five-pointer just before half-time. An impressive drive led to Foley breaking the line and linking up impressively with Ashley-Cooper, who spun and touched down out wide for his 30th Test try. Foley reduced the margin to a point at the break with a 42m penalty. He and French five-eighth Camille Lopez traded penalties in a hard-fought second half and Cheika injected veteran playmakers Quade Cooper and Will Genia off the bench. French substitute Rory Kockott's 71st-minute penalty put the French up by 10, but Australia gave themselves hope with a brilliant team try in the 74th minute - a Cooper ball allowing Simmons to cross under the posts. But the comeback fell short, handing France their first win over Australia since a 33-6 triumph at the same venue in 2012.